Residents of USJ23 in Subang Jaya have proven that the "Kampung" community spirit can thrive in the urban setting. The two-year-old residential area has much to be proud of - thanks to a few community-minded residents who saw the benefits of working together to create a safer and more comfortable living environment. First-timers to USJ23 will notice its strangely isolated location, away from the other busier and brighter USJ areas. It is situated across the Puchong highway bordered by a gas pipeline, a quarry and the highway itself. houses occupied. It had ideal conditions for crime and break-ins; they were so rampant that the residents decided to do something about it. About 15 residents decided on starting a night patrol with three members per night rostered to patrol the neighbourhood in the early hours of the mornings. The humble beginnings of the neighbourhood watch has now become the core of the neighbourhood. Today, the participation rate for the night watch is about 80% of the 138 households. In October last year, following reports of house break-ins during the day, residents engaged two security guards from 5am to 5pm, with the night watch retained from 2am to 5am. Residents pay RM40 a month for the security service. A guardhouse and barriers were purchased and constructed. Besides security, there were other problems which were of concern. The nearby granite quarry was operating round the clock but following pressure from the residents, it has cut down its operating hours by half. The residents are now trying to get a sound barrier put up to shield it from the highway traffic noise, to put up road signs and to get the playground in good condition. Sharing the same concerns has drawn the residents together. Success has motivated them to maintain their cohesiveness. 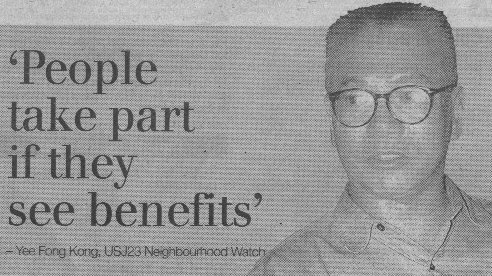 "People will be more willing to contribute and play their part if they can see the benefits," says USJ23 Residents and Neighbourhood Night Watch Pro-Tem committee chairman Yee Foon Kong. 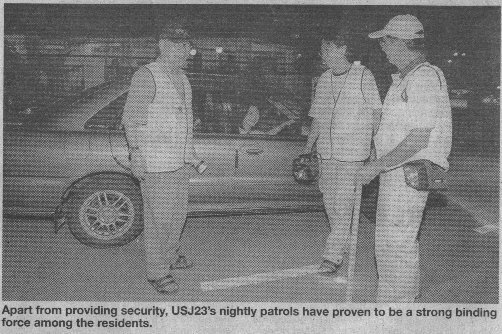 The night patrols have been the binding force of the community. Many of the residents got to know each other through the night watches which were seen as a good way to know your neighbours. 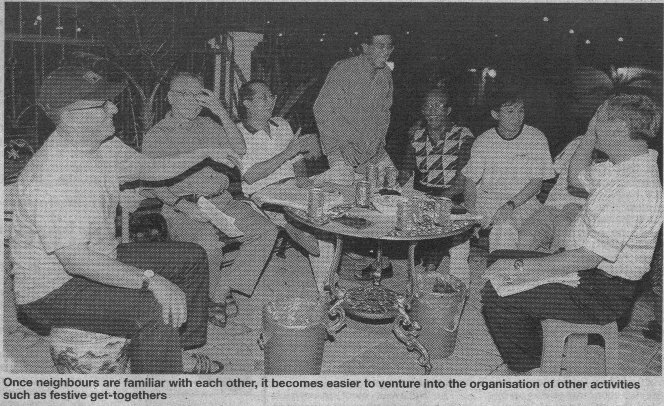 "Once people are familiar with each other, it was easier to venture into other activities such as festive family get-togethers and newspaper recycling programmes," says Yee. The committee now hopes to recreate the kampung concept in urban living, encouraging harmony and accord among the multi-racial community. As such, residents here avoid talking about race, religion and politics to avoid conflict. Every row of houses is assigned a row leader. Before monthly meetings, row leaders obtain feedback from residents in their respective rows about issues they want to be raised and discussed. After each meeting, residents are updated on the outcome of the discussion. "Residents know there is a channel for their voices to be heard. So, when things need to be done, they will give their support," says Yee. The community is considerably smaller than other housing areas, hence it is easier for the residents to bond and to know each other. "We know how many children there are in the neighbourhood. We can identify any stranger to the area. We also know who has moved in. We then approach them and make friends with them once they are settled in." The committee members admit that they may seem like busybodies at first but they feel it is necessary for the benefit of the neighbourhood. Being persistent is also a common trait among the committee members, especially when encountering people who are sceptical about the neighbourhood watch and its activities. "Not everyone see the benefits of a neighbourhood watch or a residents' association. We have to help them see the light," says Beh. They have to bring out their selling skills in order to "sell" the benefits of a neighbourhood watch and association. "We always ask them this: 'During an emergency, who can help you?' Your best friend may be staying in Ampang, can he come and help? You have to make friends with the people in front, back, left and right of you as they are the ones nearest to you," adds Yee. The Internet has also been a tremendous help in bringing the residents closer and more involved. Initially, newsletters were published monthly but when it was found that the majority of the homes are wired, the idea of a website was mooted. The USJ23 neighbourhood website is now the pride of the residents. It was set up last year with the help of a committee member, Robert Chan, an IT enthusiast. With the website, communication with residents was quicker and there is now international publicity on what the neighbourhood is doing. "We want to get things done and publicise it, so that residents can feel proud of their achievements," says Yee. In coming up with contents for the website, Chan says it was important to look at the needs of the residents. "There is no point if the website contains information which is useless. "It is better if a resident maintains the homepage so that the information can constantly be updated. The website is like a local newspaper and we do not want stale news." The website provides free web pages for residents who have certain products or services to offer. It also contains a diary of events, the night watch roster, minutes of monthly meetings, updates of current concerns and action taken, links to other communities in USJ and a neighbourhood forum. The website has also become a pressure tool. For instance, if there are any problems which needs the attention of the local council, everyone can read about the problem on the website - including the local council which will feel the pressure to do something about it since the problem is in the open. The committee members are all working people who do not deny that taking up the voluntary work take up a lot of time and energy. Nevertheless, they seem to be enjoying themselves. They attribute their success to teamwork and commitment. "We constantly encourage and help each other with our tasks. It is also important that committee members volunteer their service not for personal glory but for the common good. The only reward is the feeling of personal satisfaction when something is done well," says Yee. The committee is determined to turn their neighbourhood into a kampung and hope that their passion will be contagious.